Mess-Less Liquid Nail Tape is the answer to every polish addict’s needs. 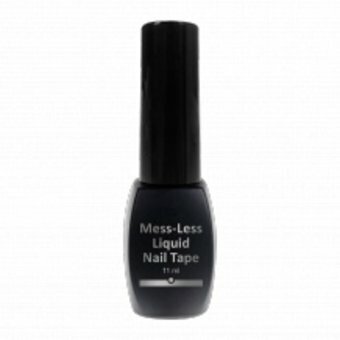 Mess-Less Liquid Nail Tape creates a protective barrier for your cuticles when polishing your nails. techniques that often mess on the surrounding skin e.g. water marbling, sponge technique, stamping. the surrounding skin, simply peel it off! this product, it is the ideal product for home use too! on application. Wait for it to dry. It then becomes transparent pink. Apply polish. Peel off Less-Mess Liquid Nail Tape. A perfectly clean, crisp application.